Maria Soklis of Cox Automotive Canada says those who invest now, she said, stand the best chance to prosper through the coming technical and cultural changes affecting seemingly every aspect of car ownership and driving. TORONTO -- Maria Soklis has a simple message for Canada’s automotive leaders: Buckle up and prepare to shift. 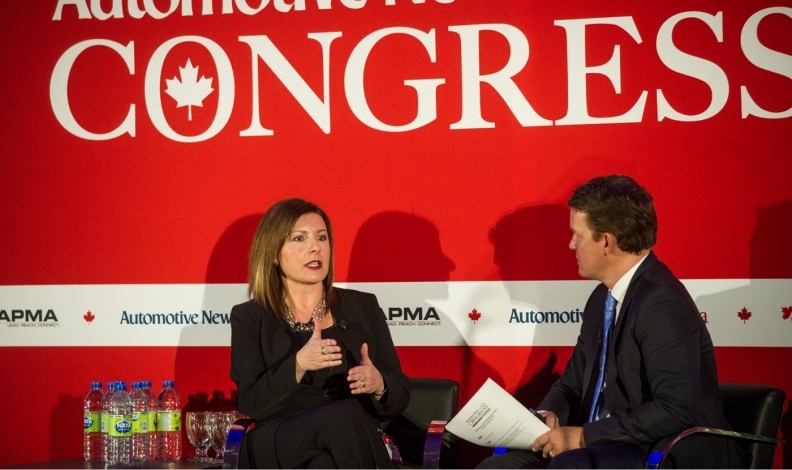 “Transformation in our industry is imminent, and it’s going to be complex,” the Cox Automotive Canada president warned attendees at the first Automotive New Canada Congress in Toronto on Feb. 16. And those who invest now, she said, stand the best chance to prosper through the coming technical and cultural changes affecting seemingly every aspect of car ownership and driving. For dealers, lenders and others who serve car buyers, this could sound like old news. They’ve seen the Internet and the smart phones and believe they’ve adapted. And certainly, sales have been strong, with record demand in Canada for nearly four years. “In the last decade, despite the less than desirable reputation of our industry and the cumbersome buying experience, you could still be relatively successful,” said Soklis. That’s unlikely to fly, however, as trends from online purchasing to car-sharing become mainstream. And while no one knows when truly autonomous cars will hit the streets, many believe it will come soon. The old manufacturing, distributing and sales models won’t apply. Soklis, whose growing company offers products and services for dealers and car buyers, suggests online is the first place for retailers to start preparing for change. One study suggests 10 per cent of Canada vehicle purchases will be made entirely online by 2019, up from six per cent now. And the proportion is sure to keep growing. Consumers want a quick, clear process. In a discussion with Automotive News Canada publisher Jason Stein, Soklis acknowledged that the pressure on manufacturers and dealers to “hit numbers” will always be present. That, however, shouldn’t distract from the coming trends and changes that could see the car business transformed to the degree of the travel industry, which in the span of a few years went from travel agent bookings to AirBNB. Soklis, who was vice-president and chief operating officer of Kia Canada before moving to Cox, stressed that coming changes also hold potential opportunities for those willing to adapt.